Looking for a New Nissan Pathfinder in your area? CarGurus has 1,128 nationwide Nissan Pathfinder dealers with 27,795 new car listings. Throughout its life, the Nissan Pathfinder has undergone a number of transformations. When launched back in 1985, it was a go-anywhere off-road SUV. The current model, which was introduced for the 2013 model year, became a 3-row crossover built with families in mind. After a major refresh in 2017, Nissan is only making a small number of minor changes for the Pathfinder. The most important change enhances the Pathfinder’s safety. Nissan has added automatic emergency braking and rear door alert as standard equipment. The latter feature will remind the driver to look in the backseat if the system detects the rear door was opened before a trip but not opened again after the vehicle was shut off. If a driver leaves without looking, the system will honk the horn to get their attention. 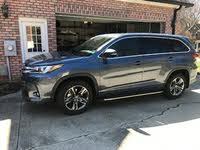 This comes on top of a comprehensive set of safety features that include a large number of airbags, traction and stability control, a back up camera, and tire pressure monitoring with easy-fill tire alert, which honks the horn to let you know that the tire is filled up to the correct pressure. Optional features include blind-spot monitoring, rear cross-traffic alert, adaptive cruise control, and a surround-view camera system. The National Highway Traffic Safety Administration awarded the Pathfinder a 5-Star overall rating, and the Insurance Institute for Highway Safety rated the Pathfinder ‘Good’ in most of their tests. The only one the Pathfinder faltered was the new headlight test, where it earned a ‘Marginal’ rating. A big complaint of the pre-refreshed Pathfinder was the anonymous styling. The model lacked traits that could help it stand out from a growing crowd of three-row crossovers. Nissan addressed this somewhat with the refresh by adding new bumpers with squared-off corners and a larger front grille. For 2018, Nissan is expanding the availability of the Midnight Edition appearance package to the SL, which adds blacked-out trim, 20-inch aluminum-alloy wheels with a black finish, and three color choices - Pearl White, Gun Metallic, and Magnetic Black. The Pathfinder’s interior is a bit of a mixed bag. Automotive reviewers like the simple control layout, easy to use infotainment system, spacious front seats, and a long list of standard equipment. However, they aren’t so keen on the dated design, the position of 2nd-row seats that causes the passenger’s knees to be put into an awkward position, and a small cargo area for its class. Like most crossovers in its class, the Pathfinder’s 3rd row is best reserved for small children due to the limited amount of legroom. Power comes from a 3.5-liter V6 engine that produces 284 horsepower and 259 pound-feet of torque. This is paired with a continuously-variable transmission and the choice of front-wheel or Nissan’s 4x4-i all-wheel drive system. The V6 moves the Pathfinder with authority as power comes on smooth and steady, and it gives the Pathfinder a towing capacity of 6,000 pounds - about 1,000 pounds more than the Honda Pilot and Toyota Highlander. EPA fuel economy figures for the 2018 Pathfinder stand at 20 City/27 Highway/23 Combined mpg for the FWD model and 19/26/22 mpg for the AWD model. Ride comfort is about average for the class with a few bumps coming inside. Reviewers aren’t so keen on the Pathfinder’s handling as it doesn’t feel agile when going around a corner. What's your take on the 2018 Nissan Pathfinder? Have you driven a 2018 Nissan Pathfinder? 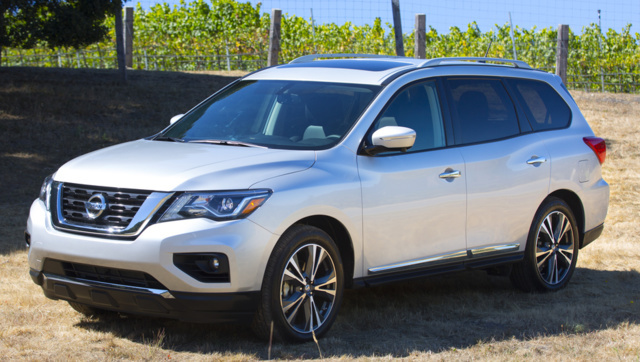 Enter your zip to see incentives for a new Pathfinder in your area. Who has free shipping on CPO 2018 Pathfinder SL?